Google Inc (NASDAQ:GOOG)’s Glass — the high tech pair of glasses — is expected to hit store shelves later this year. The company said it would begin shipping prototypes of Glass to developers on Monday. But while the device has attracted a lot of media attention, little has been said about Google’s strategy. With Glass, Google is making yet another move toward the complete dominance of the web. As with its Android operating system, Google Glass’ true function is to serve as a gateway for other Google services. As opposed to Apple Inc (NASDAQ:AAPL), Google opts to give away its mobile operating system for free. This strategy has led to widespread market adoption and a dominance of global market share. While Apple currently has about 20% of the global smartphone market, Android is near 70%. Apple Inc (NASDAQ:AAPL) makes money selling devices that run its iOS; Google merely wants users on its web services. Get an Android phone, and you’re more likely to use gmail, Google Maps, Google Docs, Google+ and Google search — at least in theory. Like Android, Google Inc (NASDAQ:GOOG) gives all these services away for free to bolster ad sales. The more Google services you use, the more data the company can collect on you, and the more targeted and profitable ads Google can sell. Microsoft Corporation (NASDAQ:MSFT)’s anti-Google “Scroogled” advertisement campaign is built around bringing this to light. Someone wearing Google Glass will likely be utilizing at least five of the company’s web services on a regular basis, and possibly more. Google’s promo video for Glass shows four in action: Google search, Google Hangouts, Google Maps, and Google Now. At the same time, Glass syncs with cloud storage — Google Docs. Someone searching on their mobile phone or desktop computer may opt to go with Microsoft Corporation (NASDAQ:MSFT)’s Bing instead of Google, but that person using Glass to search likely won’t have a choice. The same can be said for a service like Dropbox — a user may prefer it over Google Docs, but if that user’s Google Glass content is being sent there already, why not make life simpler and stick with Google? Google Hangouts — the company’s alternative to Microsoft Corporation (NASDAQ:MSFT)’s Skype — seems to be a major part of Google Glass. Using Hangouts, a Glass user can video chat directly with their friends and show them what they’re looking at. But Hangouts isn’t a standalone product — in fact, it’s a feature of Google+, Google’s social network. While Google+ has failed to pressure Facebook Inc (NASDAQ:FB), widespread Google Glass adoption could tip the scales in Google Inc (NASDAQ:GOOG)’s favor. Glass users could come to use Google+ as their predominant social network, severely damaging Facebook’s business. Currently, Facebook Inc (NASDAQ:FB) has a commanding lead over Google+. Global Web Index gives Facebook roughly 700 million active users in the fourth quarter of 2012, while Google+ has less than half that at about 300 million. Up until this point, there’s been little reason to ditch Facebook for Google+. 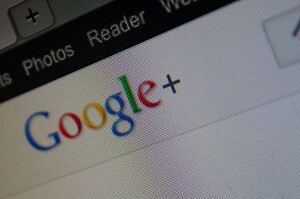 With most people already on Facebook, why go to Google+? Other social networks exist alongside Facebook — Twitter and LinkedIn Corp (NYSE:LNKD), notably — but these networks largely serve fundamentally different needs than Facebook. Google+ is the closest thing to an exact competitor. If Google Glass brings more people to Google+, Facebook Inc (NASDAQ:FB) could face its biggest threat yet. Apple Inc. (AAPL): Calling Bottom Is Dangerous Apple Tablet Sales: Apple Can Rely on PC and Tablet Sales in the Future, Right... Apple Inc. (AAPL), Cirrus Logic, Inc. (CRUS): Why Did My Stock Just Die? Advanced Micro Devices, Inc. (AMD): Can Game Consoles Save It? Comcast Corporation (CMCSA), Google Inc (GOOG): Will Twitter Become the Next... What to Expect of Apple Inc. (AAPL)?